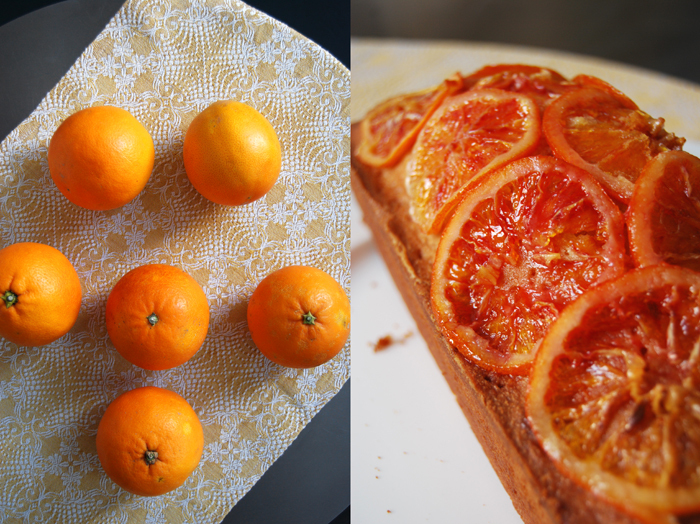 Two things led to this cake, firstly, I haven’t written about blood oranges in more than two weeks, secondly, my mother. She reads (nearly) everything I share on eat in my kitchen, she is my mother after all. She recently mentioned that my photos could do with some new decoration. She’s a woman of action, so within a few days she sent me a parcel packed with some pots, silver plates and a selection of her favourite linen from an artisan weaver in the Italian Dolomite Alps. I’m not really a big decorator, I’m more of a minimalist but I’m open to some inspiration, especially when it comes from my mother. The package arrived, with beautiful handwoven craftsman’s work, a table cloth and runners in various colours and designs. One of them caught my attention, a golden yellow design, a bit more frilly than my usual style but I liked it. I knew it would need to be paired with the right food to unfold its beauty. 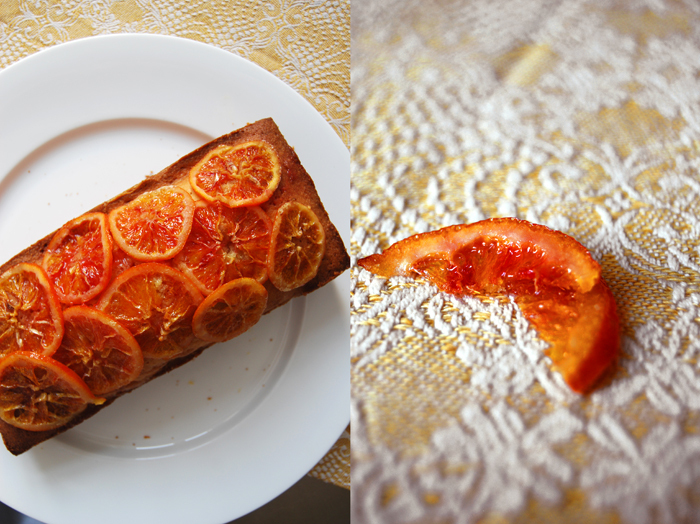 The inspiration came within a split second, a spongy blood orange cake with sugared slices on top, a bit opulent and the fruits are also from Italy, like the cloth. 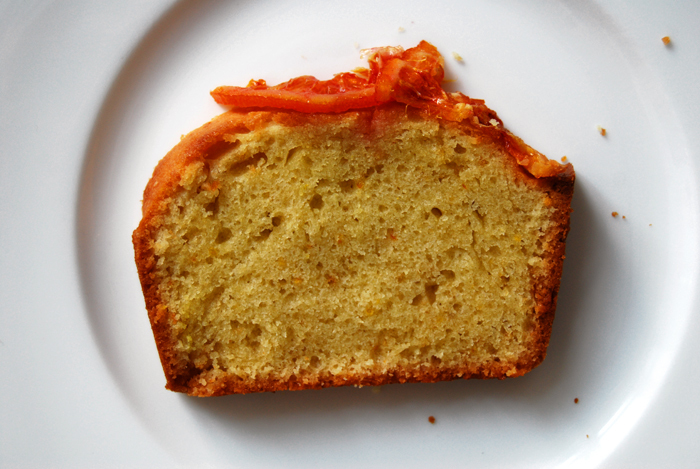 For this recipe you need a 24cm x 10,5cm / 9.5″ x 4″ loaf tin. Set the oven to 160°C / 320°F (fan-assisted oven) and line your loaf tin with parchment paper. For the topping, cook the orange slices, sugar and water in a sauce pan on high temperature for around 5 minutes until the water has evaporated. Put aside. Mix the butter together with the sugar till fluffy. Add the eggs, one at a time, and continue mixing for a couple minutes. Mix the orange juice and zest into the mixture, gently fold in the flour combined with baking powder and scoop into your prepared tin. 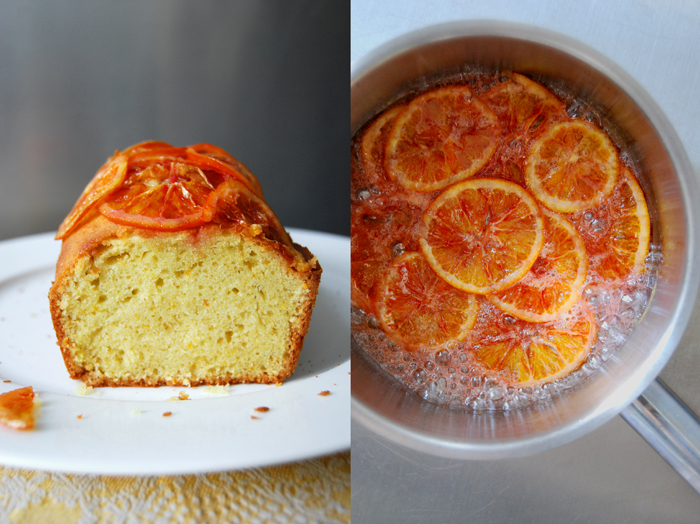 Bake for 35 minutes, take it out and arrange the sugared orange slices on top. Bake for another 15 minutes. Check with a skewer, it should come out clean. 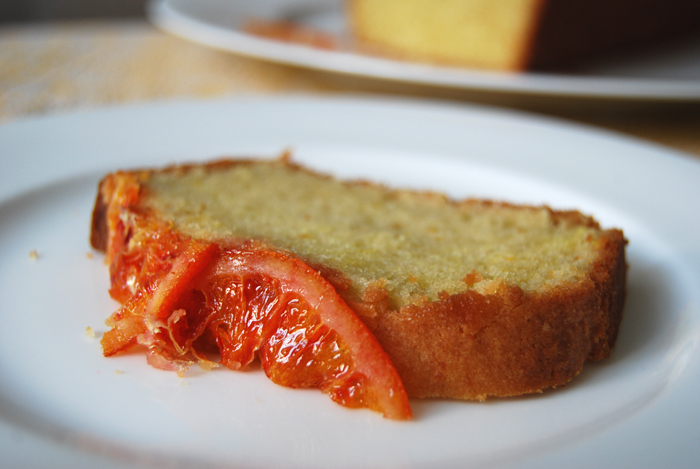 Mix the icing sugar with 4 tablespoons of blood orange juice for the syrup and pour over the cake (you can spike the top of the cake). Thank you Sarah! Yes, she’s very sweet! I will tell her that you like it as she will come to visit me tomorrow for a few days.